Free samples of foods made with vegetables that can be found at the Johnnie Mae Farm stand will be available Friday, August 10, 2018 from 4 to 7 p.m. The Johnnie Mae Farm is located in the Renaissance Pointe Neighborhood at 2518 Winter St.
Staff from the Purdue Extension – Allen County offices will prepare several recipes using vegetables such as zucchini, summer squash, tomatoes and cucumbers and offer samples to anyone who stops by the farm stand. Plenty of recipes using a variety of fresh produce will also be available to take home. Members of the City’s Housing & Neighborhood Services (HANDS) Board today toured five projects supported in part by the City of Fort Wayne’s federal housing dollars. July 20, 2018 – Residents can now report dead and hazardous trees to Neighborhood Code Compliance by calling 311. Neighborhood Code Compliance is responsible for new regulations regarding dead and hazardous trees; the changes were made to City Code last year in response to concerns about safety from neighborhood leaders. Neighborhood Code will issue a 30-day order to abate (remove) if trees are certified by an arborist to be completely dead and are in a location where they could damage property or fall into an alley or roadway. 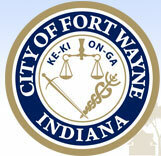 July 19, 2018 -- Funding the City of Fort Wayne receives from the U.S. Department of Housing and Urban Development (HUD) is being used to demolish a home on the Vincent Village campus and build a new one in its place. The new energy-efficient three-bedroom Lillie Street home will become part of Vincent Village’s Community Rental Home Program and will be available to a family that is currently living in the Vincent House Shelter or another area homeless shelter. The City of Fort Wayne’s Office of Housing & Neighborhood Services invites residents to purchase fruits and vegetables at the Johnnie Mae Farm Stand Fridays through October from 4 to 7 p.m. The Johnnie Mae Farm is located in the Renaissance Pointe Neighborhood at 2518 Winter St.
A variety of fresh produce grown on-site will be available to local residents. Possible items for purchase include collard and mustard greens, oregano, thyme, radishes, tomatoes, sweet corn, zucchini, green beans, peppers, broccoli, cabbage, brussels sprouts and watermelon.